An Appendix concerning the Description and Use of a small Portable Quadrant, for the more easie finding of the Hour and Azimuth, and Other Astronomical and Geometrical Conclusions. Of the Description of the Quadrant. Having described these standing Planes, I will now shew the most of these Conclusions by a small Quadrant. This might be done generally for all Latitudes, by a quarter of the general Astrolabe, described before in the Use of the sector; and particularly for any one latitude, by a quarter of the particular Astrolabe, there also described; which if it be a Foot Semidiameter, may shew the Azimuth unto a Degree, and the time of the Day unto a Minute: But for ordinary use this smaller Quadrant may suffice, which may be made portable in this manner. Upon the Center A, and Semidiameter AB, describe the Ark BC; the same Semidiameter will set of 60 gr. and the half of that will be 30 gr. which being added to the former 60 gr. will make the Ark BC to be 90 gr. the fourth part of the whole Circle, and thence comes the name of a Quadrant. Leaving some little space for the Inscription of the Months and Days, on the same Center A, and Semidiameter AT, describe the Ark TD, which shall serve for either Tropick. Divide the Line AT in the Point E, in such a proportion, as that AT being 10000, AE may be 6556, and there draw another Line EF, which shall serve for the Equator; or AE being 10000, let ET be 5253. Divide AF the Semidiameter of the Equator in the Point G, so as AF being 10000, the Line AG may be 4343: and on the Center G, and Semidiameter GD, describe the Ark ED, which shall serve for a fourth part of the Ecliptick. This part of the Ecliptick may be divided into three Signs, and each Sign into 30 gr. by a Table of Right Ascensions, made as followeth. A Table of Right Ascensions. Gr. M. Gr. M. Gr. M.
As the Right Ascension of the first Point of ♉ being 27 gr. 54 m. you may lay a Ruler to the Center A and 27 gr. 54 m. in the Quadrant BC, the Point where the Ruler crosseth the Ecliptick shall be the first Point of ♉. In like manner, the Right Ascension of the first Point of ♊ bein 57 gr. 48 m. if you lay a Ruler to the Center A and 57 gr. 48 m. in the Quadrant, the Point where the Ruler crosseth the Ecliptick shall be the first Point of ♊: And so for the rest. But the Lines of distinction between Sign and Sign may be best drawn from the Center G.
The Line ET between the Equator and the Tropick, which I call the Line of Declination, may be divided into 23 gr. ½ out of this Table. For let AE the Semidiameter of the Equator be 10000, the distance between the Equator and 10 gr. of Declination may be 1917 more; between the Equator and 20 gr. 4281; the distance of the Tropick from the Equator 5252. You may put in the most of the principal Stars between the Equator and the Tropick of ♋, by their Declination from the Equator, and the Right Ascension from the next Equinoctial Point. As the Declination of the Wing of Pegasus being 13 gr. 7 m. the Right Ascension 358 gr. 34 m. from the first Point of ♈, or 1 gr. 26 m. short of it. If you draw an occult Parallel through 13 gr. 7 m. of Declination, and then lay a Ruler to the Center A, and 1 gr. 26 m. in the Quadrant BC, the Point where the Ruler cosseth the Parallel shall be the Place for the Wing of Pegasus, to which you may set the name and the time when he cometh to the South at midnight in this manner: W. Peg. * 23 Ho. 54 M. And so for the rest of these five, of any other Stars. Ho. M. Ho. M. Ho. M.
There being space sufficient between the Equator and the Center, you may there describe the Quadrant, and divide each of the two Sides farthest from the Center A into 100 parts; so shall the Quadrant be prepared generally for any Latitude. But before you draw the particular Lines, you are to fit four Tables under your Latitude. First, a Table of Meridian Altitudes, for division of the Circle of Days and Months, which may be thus made. Consider the Latitude of the Place, and the Declination of the Sun for each Day of the Year. If the latitude and Declination be alike, both North, or both South, add the Declination to the Complement of the Latitude; if they be unlike, one North, and the other South, subtract the Declination from the Complement of the Latitude, the Remainder will be the Meridian Altitude belonging unto the Day. Thus in out Latitude of 51 gr. 30 m. Northward, whose Complement is 38 gr. 30 m. the Declination upon the tenth day of June will be 23 gr. 30 m. Northward; wherefore I add 23 gr. 30 m. unto 38 gr. 30 m. the sum of both is 62 gr. for the Meridian Altitude at the tenth of June. The Declination upon the tenth of December will be 23 gr. 30 m. Southward, wherefore I take these 23 gr. 30 m. out of 38 gr. 30 m. there will remain 15 gr. for the Meridian Altitude at the tenth of December; and in this manner you may find the Meridian Altitude for each Day of the Year, and set them down in a Table. Month. Gr. M. Gr. M. Gr. M. Gr. M. Gr. M. Gr. M. Gr. M.
So the Sine of 90 gr. to the Sine of the Intersection where the Horizon shall cross the Tropick. So in our Latitude of 51 gr. 30 m. we shall find the Horizon to cut the Tropick in 33 gr. 9 m. wherefore if you lay the Ruler to the Center A, and 33 gr. 9 m. in the Quadrant, the Point where the Ruler crosseth the Tropick shall be the Point where the Horizon crosseth the Tropick. And if you find a Point H in the Line AC, whereon setting the Compasses, you may bring the Point at E and this Point in the Tropick both into a Circle, the Point H shall be the Center, and the Ark so drawn shall be the Horizon. So the Tangent of the Horizon, to the Tangent of the Ark in the Quadrant, which shall divide the Horizon. So in our Latitude of 51 gr. 30 m. we shall find 7 gr. 52 m. belonging to 10 gr. in the Horizon, and 15 gr. 54 m. belonging to 20 gr. And so the rest, as in the Table. A Table for dividing the Horizon. Wherefore you may lay the Ruler to the Center A, and 7 gr. 52 m. in the Quadrant BC, the Point where the Ruler crosseth the Horizon shall be 10 gr. in the Horizon; and so for the rest. But the Lines of distinction between each fifth Degree will be drawn from the Center M.
The third Table for drawing of the Hour-lines must be a Table of the Altitude of the Sun above the Horizon at every Hour, especially when he commeth to the Equator, the Tropick, and some other intermediate Declinations. So the Co-sine of the Hour from the Meridian, to the Sine of the Altitude. Thus in our Latitude of 51 gr. 30 m. at six Hours from the Meridian the Sun will have no altitude, at five the Altitude will be 9 gr. 17 m. at four 18 gr. 8 m. at three 26 gr. 7 m. at two 32 gr. 37 m. at one 36 gr. 58 m. at Noon it will be 38 gr. 30 m. equal to the Complement of the Latitude. So the Sine of the Declination, to the Sine of the Altitude. Thus in our Latitude the Declination of the Sun being 23 gr. 30 m. the Altitude will be found to be 18 gr. 11 m. the Declination being 11 gr. 30 m. the Altitude will be 9 gr. So the Tangent of the Latitude, to the Tangent of a fourth Ark. So in our Latitude, and one Hour from the Meridian, this fourth Ark will be found to be 52 gr. 28 m. at two 55 gr, 26 m. at three 60 gr. 39 m. at four 68 gr. 22 m. and at five Hours from the Meridian 78 gr. 22 m.
Then consider the Declination of the Sun, and the Hour proposed; if the Latitude and Declination be both alike, as with us in North Latitude, North Declination, and the Hour fall between Noon and six, take the Declination out of the fourth Ark, the remainder shall be our fifth Ark. So the Co-sine of the fifth Ark, to the Sine of the Altitude. So the Sine of 35 gr. 8 m. the Complement of your fifth Ark, to the Sine of 27 gr. 17 m. the Altitude required. Ut OE radius, ad EM Co-tan. Lat. Ita OD Cosi. Hora, ad DH Tan. DH. Cujus aqualis est PR, cujus Compl. DR, novis dr. arcus quarius. ad Cosi SZ. Ad Sin. AS. Hins forte prastabit vacare HS Arcum quintus, iat secunda operatio instituetur per solos sinus. Ita Cosi. Lat. OD, ad Cosi. An. OHD. Ita Sin. DO, ad Sin. H.
Ita Radius, ad Tan. Ang. H.
Ita Rad. Ad Sin. H.
Ita Sinus Anguli ad Horiz. SHA, ad Sin. Solaris Altitudinis SA. So the Co-sine of 78 gr. 8 m. to the Sine of 9 gr. 32 m. for the Altitude required. As the Sine of 60 gr. 39 m. to the Sine of 51 gr. 30 m.
So the Co-sine of 84 gr. 9 m. to the Sine of 5 gr. 15 m. for the Altitude required. And so by one or the other of these means you may find the Altitude of the Sun for any Point of the Ecliptick at all Hours of the Day, and set them down in such a Table as this. A Table for the Altitude of the Sun in the geginning of each Sign at all Hours of the Day, calculated for 51 gr. 30 m. of North Latitude. Gr. M. Gr. M. Gr. M. Gr. M. Gr. M. Gr. M. Gr. M.
Lastly, You may find what Declination the Sun hath when he riseth or setteth at any Hour. So the Co-tangent of the Latitude, to the Tangent of the Declination. And so in the Latitude of 51 gr. 30 m. you shall find that when the Sun riseth, either at 5 in the Summer, or seven in the Winter, his Declination is 11 gr. 37 m. when he riseth at four in the Summer, or eight in the Winter, his Declination is 21 gr. 40 m. which may also be set down in the Table. That done, you may there see, that in this Latitude the Meridian Altitude of the Sun in the beginning of ♋ is 62 gr, in ♊ 58 gr. 42 m. in ♉ 50 gr. in ♈ 38 gr. 30 m. &c. But the beginning of ♋ and ♑ is represented by the Tropick TD, drawn at 23 gr. 30 m. of Declination, and at the beginning of ♈ and ♎, by the Equator EF. If you draw an occult parallel between the Equator and the Tropick, at 11 gr. 30 m. of Declination, it shall represent the beginning of ♉, ♍, ♏ and ♓, if you draw another occult Parallel through 20 gr. 12 m. of Declination, it shall represent the beginning of ♊, ♌, ♐ and ♒. Then you may lay a Ruler to the Center A, and 62 gr. in the Quadrant BC, and note the Point where it cosset the Tropick of ♋; then move the Ruler to 58 gr. 52 m. and note where it cosset the Parallel of ♊; then to 50 gr. and note where it crosseth the Parallel of ♉; and again to 38 gr. 30 m. noting where it crosseth the Equator: so the Line drawn through these Points shall shew the Hour of 12 in the Summer, while the Sun is in ♈, ♉, ♊, ♋, ♌, or ♍. In like manner, if you lay the Ruler to the Center A, and 27 gr. in the Quadrant, and note the Point where it crosseth the Parallel of ♓; then move to 18 gr. 18 m. and note where it crosseth the Parallel of ♒; and again to 15 gr. noting where it cosset the Tropick of ♑; the Line drawn through these Points shall shew the Hour of 12 in the Winter, while the Sun is in ♎, ♏, ♐, ♌, ♒, and ♓; so may you draw the rest of these Hour-lines: only that of 7, from the Meridian in the Summer, and 5 in the Winter, will cross the Line of Declination at 11 gr. 37 m. and that of 8 in the Summer, and 4 in the Winter, at 21 gr. 40 m.
So the Co-tangent of the Latitude, to the Tangent of the Altitude at the Equator. Thus in our Latitude of 51 gr. 30 m. at 90 gr. from the Meridian the Sun will have no Altitude; at 80 gr. the Altitude will be 7 gr. 52 m. at 70 gr. it will be 15 gr. 30 m. at 60 gr. it will be 21 gr. 41 m.
So the Co-sine of the Altitude at the Equator, to the Sine of a fourth Ark. When the Latitude and Declination are both alike in all Azimuths from the prime Vertical unto the Meridian, add this fourth Ark unto the Ark of Altitude at the Equator. When the Latitude and Declination are both alike, and the Azimuth more than 90 gr. distant from the Meridian, take the Altitude at the Equator out of this fourth Ark. When the Latitude and Declination are unlike, take this fourth Ark out of the Ark of the Altitude at the Equator, so shall you have the Altitude of the Sun belonging to the Azimuth. Thus in our latitude of 51 gr. 30 m. Northward, if it were required to find the Altitude of the Sun in the Azimuth of 60 gr. from the Meridian, when the Declination is 23 gr. 30 m. Northward, you may find the Altitude at the Equator belonging to this Azimuth to be 21 gr. 41 m. by the former Canon; and by this last Canon you may find the fourth Ark to be 28 gr. 15 m. Then because the latitude and Declination are both alike to the Northward, if you add them both together, you shall have 49 gr. 56 m. for the Altitude required. Tables for the Altitude of the Sun in the beginning of each Sign for every tenth Azimuth. Lat. 50 Gr. 00 M.
If the Declination had been 23 gr. 30 m. to the Southward, you should then have taken this fourth Ark out of the Ark at the Equator; which because it cannot here bee done, it is a sign that the Sun is not then above the Horizon: But if you take the Ark at the Equator out of this fourth Ark, you shall have 6 gr. 34 m. for the Altitude of the Sun when he is in the Azimuth of 60 gr. from the North, and 120 gr from the South part of the Meridian. The like reason holdeth for the rest of these Altitudes, which may be gathered, and set down in a Table. Lastly, when the Sun riseth or setteth upon any Azimuth, to find his Declination. 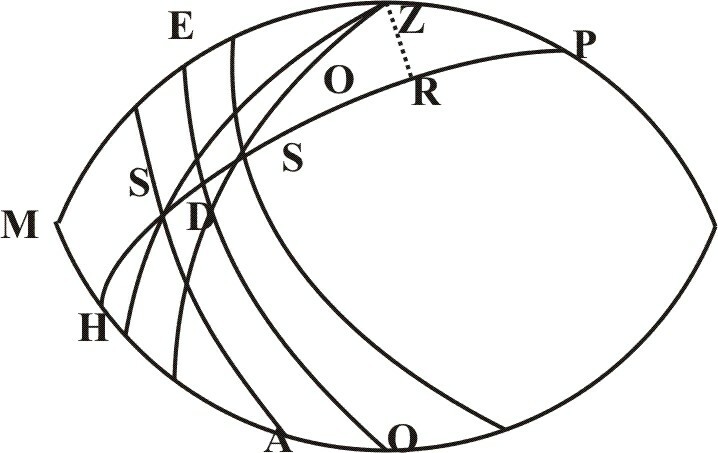 So the Co-sine of the Azimuth from the Meridian, to the Sine of the Declination. A Table for the Altitude of the Sun in the beginning of each Sign for every tenth Azimuth, in 51 gr. 30 m. of North Latitude. And thus in our Latitude of 51 gr, 30 m,. when the Azimuth is 80 gr. from the meridian, the Declination will be found to be 6 gr. 12 m. if the Azimuth be 70 gr. the Declination will be found 12 gr. 18 m. if 60 gr. then 18 gr. 8 m. And so the rest, which may be also set down in the Table. That done, if you would draw the Line of East or West, which is 90 gr. from the Meridian, lay the Ruler to the center A, and 30 gr. 38 m. numbred in the Quadrant from C to ward B, and note the Point where it crosseth the Tropick of ♋; then move the Ruler to 26 gr. 10 m. and note where it crosseth the Parallel of ♓; then to 14 gr. 45 m. and note where it crosseth the Parallel of ♉; then to 0 gr. 0 m. and you shall find it crosseth the Equator in the Point F: so a Line drawn through these Points shall shew the Azimuth belonging to East and West. The like reason holdeth for all the rest. These Lines being thus drawn, if you set two Sights upon the Line AC, and hang a Thread and Plummet on the Center A, with a Bead upon the Thread, the Fore-side of the Quadrant shall be finished. On the Back-side of the Quadrant you may place the Nocturnal described before in the Use of the Sector, which consisteth of two parts. The one is an Hour-Plane, divided equally according to the 24 Hours of the Day, and each Hour into Quarters, or Minutes, as the Plane will bear. The Center represents the North Pole; the Line drawn through the Center from XII to XII stands for the Meridian, and the lower XII stands for the Hour of XII at midnight. The other part is a Rundle for such Stars as are near the North Pole, together with the twelve Months, and the Days of each Month, fitted to the Right Ascension of the Sun and Stars, in this manner. First consider where the Sun will be at the beginning of the 5, 10, 15, 20, 25, 30, and if you will, every day of each Month, and find the Right Ascension belonging to the place of the Sun, as I shewed before. For example: The Sun at midnight, the las of December, or beginning of January, will be communibus annis about 20 gr. 40 m. of ♑, whose Right Ascension is 292 gr. 20 m. At midnight, the last of January, or beginning of February, he will be about 22 gr. 12 m. of ♒, whose Right Ascension is 314 gr. 35 m. and so the rest, which may be set down in a Table. That done, consider the Longitude and Latitude of the Stars, and thereby find their Right Ascension and Declination as I shewed before, and set them down in a Table. These Tables thus made, let the uppermost part of the Rundle be made even with the innermost Circle of the Hour-Plane, and a convenient space allowed to contain the divisions for the Days, and names of the Months. Then lay the Center of this Rundle upon the Center of some other Circle divided into 360 gr. and by the Center and 292 gr. 20 m. in that Circle, draw a Line for the beginning of January: In like manner, by the Center and 324 gr. 35 m. draw a Line for the end of January and beginning of February; and so the rest of the days of each Month. For the Inscription of the Stars, let one of the Lines from the Center, as that at the beginning of July, or rather let a movable Index be divided from the Center toward the inward Circle of the Months into 40 gr. 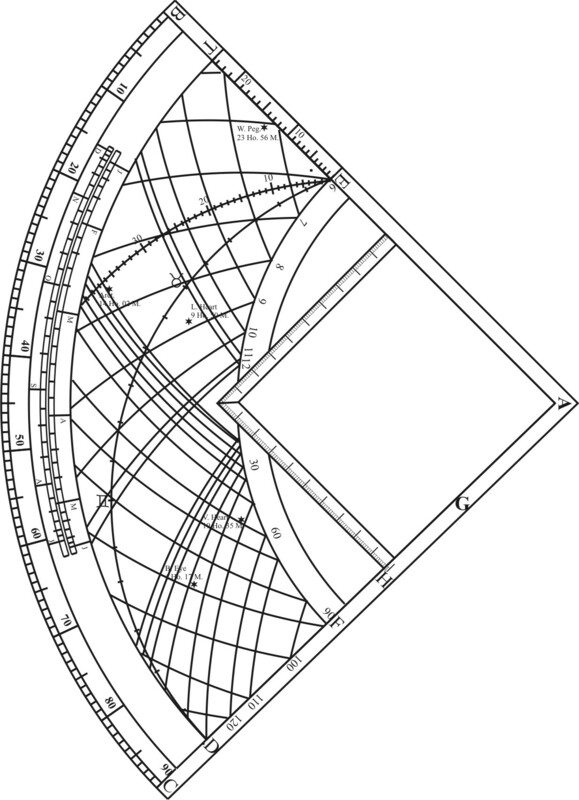 more or less, which may be done for speed equally, but for exactness in such manner as the Semidiameter of the General Astrolabe was divided before in the Use of the Sector. So laying the Index to the Right Ascension in the outward Circle, you may prick down the Stars by their Declination in the Index. For example: If the Right Ascension of the Pole-star be 6 gr. 18 m. and his Declination 87 gr. 10 m. having set the Center of the Index both to the Center of the Rundle and of the other Circle, turn the Index to 6 gr. 28 m. in that outward Circle, and prick down the Star by 87 gr. 20 m. in the edge of the Index, that is, at the distance of 2 gr. 40 m. from the Pole. The like reason holdeth for the rest of the Stars, which may be distinguished according to their Magnitudes, and then be reduced into their Forms, as in the Example. So the Quadrant will be fitted both for Day and Night.